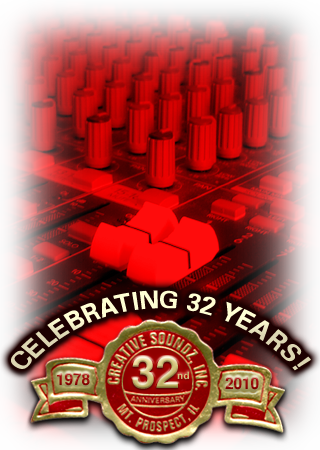 We appreciate your interest in Creative Soundz Inc. Please take the time to browse our website and view some of the talent that we provide in addition to information on sound, stage and lighting rentals and sales. Currently in our 30th year of business we have been providing "Full Production Services" all over the Midwest including our national and regional talent that we book. Our firm is considered unique in the respects that not only do we represent national and regional artists, we also have an “in house” production department with rentals of sound, staging, backline, video and lighting systems. Creative Soundz Inc. hosts a year round full time staff of office personnel and qualified technicians who are available to assist you in planning your function ...from booking your entertainment... going over stage plots... advancing electrical requirements...and those last minute entertainment details...we work with our clients to make sure each event is a success! Whether it is entertainment or production services that you need, our expertise and personal service can be an asset!